Brambles Bed and Breakfast01263 825567work01263 825567fax Guest AccommodationBrambles is a family run establishment with a warm friendly atmosphere. Having fine views over Sheringham and superb gardens. All rooms are spacious. 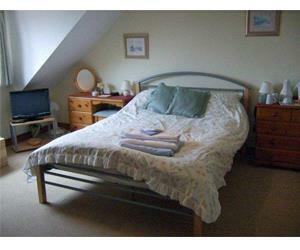 Only a few minutes walk from both the town centre and beach. Brambles has its own parking. Set in a quiet part of Sheringham on the edge of town. Visitors to Brambles can come and go as they like. Brambles is a family run establishment with a warm friendly atmosphere. Having fine views over Sheringham and superb gardens. All rooms are spacious. Only a few minutes walk from both the town centre and beach. Brambles has its own parking. The rooms are large and airy all having en-suite showers, freeview, TV & radio, mini fridges, hairdryer, refreshment tray and Wi-Fi. Full English, Continental or veggie breakfast is available. For a peaceful relaxing time Brambles is a must. Ground floor bedrooms available. Cycle storage available. Children welcome from any age. Leave the main Cromer Road (A148) into Sheringham. Into town centre straight on, turn right at the Lobster Pub, turn left into Cliff Road. Nelson Road is at the top of Cliff Road on the right.